Microvascular osteocutaneous free flaps have given reconstructive surgeons a powerful tool in the treatment of large defects involving hard and soft tissues in head and neck surgery. For example, radial forearm, scapula, iliac crest and fibula flaps have been used extensively in mandibular reconstruction. The inevitable donor site morbidity of these osteocutaneous flaps has received less attention than the reconstructive advantages. In chapter one, a review of the literature is presented for each type of flap to determine the kind, incidence and consequences of flap associated morbidity. In the future tissue-engineered prefabricated free flaps might play an important role to solve this morbidity problem. In view of this, the objective of this thesis is to develop a method for the microsurgical reconstruction of bone defects based on a tissue engineering approach. Using this technique, cultured bone marrow cells can be seeded in an appropriate carrier or scaffold in a suitable site. This so called prefabricated flap can then be transplanted with microsurgical techniques to a defect, e.g. a segmental mandibular gap. In the subsequent chapters of this thesis, the aims as described in chapter one of this thesis will be addressed. Each subsequent chapter comprises a separate investigation. 1. Can MRI be used in a longitudinal study to noninvasively detect bone formation in a rat model and can it give quantitative as well as morphological information about the construct? In animal studies on tissue engineering of bone, histology remains the standard for assessing bone formation. As longitudinal studies with this method are feasible only at the cost of large numbers of animals, we looked for an alternative. Therefore, demineralized bone matrix (DBM) and inactivated demineralized bone matrix (iDBM) implants were subcutaneously implanted in a rat. At 1, 3, 5, and 7 weeks postimplantation soft X-ray and magnetic resonance imaging (MRI) were done to monitor bone formation in the implants. At 7 weeks, the animal was killed and the implants were retrieved for histology. The results showed that in vivo MR! is well suited to assess bone formation larger than 0.5 mm in diameter and to monitor the complete three-dimensional shape of the newly formed bone in a noninvasive manner in this longitudinal study. The MRI results matched well with the histology results as obtained at 7 weeks. In contrast, X-ray imaging appeared inappropriate to monitor the bone formation process in DBM. 2. What is the best method for noninvasive monitoring of bone formation, MRI or DEXA? And can MRA be used to demonstrate the vascularity of the pedicle of a prefabricated flap? The aim of the study was to further explore the utilization of Magnetic Resonance Imaging (MRI), Magnetic Resonance Angiography (MRA) and Dual-Energy X-ray Absorptiometry (DEXA) to assess bone formation and blood circulation in a pedicled bone graft substitute. In 14 Wistar rats, initially ten weeks old, heterogeneous demineralized femur bone matrix implants were wrapped in pedicled adductor thigh muscle flaps. One rat died after surgery. Subsequently, bone formation and maintenance of blood flow was evaluated in six rats after six weeks of implantation by means of in vivo MRI/MRA and post-mortem histomorphometry. The other seven rats were left for 12 weeks, after which bone formation was evaluated by in vivo DEXA and post-mortem histomorphometry. The results demonstrated that after six weeks bone formation was present in four out of six animals, quantified as 42% (± 35%) and 25% (+ 19%) by means of MRI and histomorphometry respectively. MRA was able to show patency of the pedicles of these four rats only, which suggests that the lack of blood supply in the other two rats was the cause of failure to form bone. In the 12 week group, histology showed increased bone formation without signs of osteolysis, which was quantified histomorphometrically to be as high as 48% (± 15%). DEXA failed to show bone formation. It is concluded that in vivo MRI proved to be a reliable method for monitoring ectopic bone formation in a rat model, while in vivo DEXA was unable to detect the implants. Furthermore, in vivo MRA proved to be a very useful technique for studying the circulation of muscle flaps in this animal model. Demineralized bone matrix (DBM) has been shown to induce ectopic endochondral bone formation, when intramuscularly implanted in rats. In chapter two and three we have found a variation in-bone formation capacity of this DBM. This might be due to the properties of the DBM itself, but the use of DBM blocks could be of influence as well. Therefore, this study was designed to investigate whether increasing the surface area of the DBM by morsellizing, influences the bone formation capacity. In view of this, DBM implants and morsellized DBM (MDBM) implants were placed intramuscularly in a rat model. At six weeks the implants were retrieved and evaluated by histology and histomorphometry. The results demonstrated that significant amounts of newly formed bone were present in some DBM as well as some MDBM implants while in others no, or very little new bone was found. Histomorphometric analysis showed an average bone formation of 2.6% in DBM implants and an average of 1.9% in MDBM implants. Still, the amount of bone formation was limited compared with previous studies. It is concluded that enlargement of the surface area by morsellizing DBM implants is not an important factor in bone forming capacity. mesh or a ceramic implant? Much research has been done to develop the ideal bone graft substitute (BGS). One approach to develop this ideal BGS is the use of growth factors, but for this approach osteoprogenitor cells are needed at the site of reconstruction. An alternative is a cell-based approach, where enough cells are provided to form bone in a carrier material. In previous studies of our group, titanium (Ti) carriers have been used, because of the excellent mechanical properties and the bone-compatibility of this material. On the other hand, calcium phosphate (CaP) ceramics are known for their excellent osteoconductivity. The aim of this study is to investigate the influence of the carrier in a cell-based bone regeneration approach, whereby we hypothesize that CaP ceramic implants will induce more bone formation than Ti-fiber implants, in the same animal model as our previous experiment. Ti-fiber mesh implants and ceramic implants were seeded with rat bone marrow cells (RBM) and implanted subcutaneously Histological analysis after one, three and six weeks showed differences in the way of bone formation in the two groups: bone appeared to grow from the centre to the periphery of the implant in the titanium group, while bone formation in the ceramic group occurred through the whole implant. Histomorphometrical analysis after one week showed very limit bone formation for both the titanium and ceramic group. At three weeks the amount of bone formation was increased till about 10 percent for the titanium group and 18 percent for the ceramic group. No significant difference between the two groups could be observed. In the six week group, the bone formation was 6 (Ti) and 23 (CaP) percent, respectively (P<0.0001). Further, bone formation started earlier in the CaP ceramic scaffolds than in the Ti scaffolds. Our hypothesis could be confirmed: ceramic implants induce more bone formation than titanium implants. 5. What is the most useful acceptor site for a prefabricated flap, muscle or subcutaneous tissue? Bone Graft Substitutes (BGS) can be fabricated by the combination of three key ingredients: 1) competent bone-forming cells, 2) a suitable framework or scaffold, and 3) the presence of biological stimulants. Although much research has been done to develop the ideal BGS, the results are still not very consistent. In view of this, the cellularity and vascularity of the recipient site are supposed to be important for the osteoinductive capacity of BGS. Therefore, we hypothesized that a muscle recipient site could favor bone formation in a cell-based BGS compared to a subcutaneous recipient site due to the higher vascularity of muscle tissue. To prove this hypothesis 48 titanium (Ti) fiber mesh implants were seeded with rat bone marrow stromal cells (RBM) and implanted subcutaneously and intramuscularly in the adductor thigh muscle of rats. The amount of bone formation aftei one, three and six weeks was evaluated by histology and histomorphometry as well as by calcium content. Analysis revealed that bone formation increased during implantation. However, bone formation did not exceed above 12 percent of the implant surface, both for the intramuscular and subcutaneous recipient site. Also, no significant differences in bone amount between these two sites existed. Consequently, our hypothesis could not be confirmed. 6. What is the influence of a microsurgical anastomosis of the vascular pedicle of a prefabricated muscle flap on the tissue engineered bone in this flap? We have conducted a series of studies with the ultimate goal of developing a method for microsurgical reconstruction of bone defects with the help of tissue engineering techniques. In this study we determined how microsurgery affects the bone forming capacity of the final construct. Therefore we implanted 16 ceramic implants with cultured cells in the adductor thigh muscle flap of the rat, which was enveloped by a silicone sheet. After four weeks the pedicles of eight flaps were cut and directly microsurgically anastomosed. The other eight flaps were given a sham operation, in which all branches of the pedicle were cut and ligated, but the main pedicle was left intact. Four weeks after the second surgery, all implants were harvested and analyzed by histology and histomorphometry. The histological appearance of the bone was found to be similar in both groups. Histomorphometry did not reveal statistical significant differences in bone formation. We conclude that in a rat model viable microsurgical bone flaps can be obtained by using a cell-based tissue engineering approach. In this thesis, we have described the development of a method for microsurgical reconstruction of bone defects with the help of tissue engineering techniques. We have created a model of a prefabricated bon< in a pedicled muscle flap, which was revascularised. The ultimate goal of reconstructing a mandible in a human being has yet to be achieved. First of all, the next step should be the use of a larger animal model like a goat, to study mandibular reconstruction1-2. In larger animals, new challenges will arise. Nevertheless, the effectiveness of the combination of cell-based scaffolds and prefabrication has always to be proven in higher animals, before its application in humans. In this context, the combination of growth factors and cells with a carrier might be advantageous compared to the use of growth factors or cells alone. For example, it can allow a decrease in the concentration of these growth factors that have to be use to induce bone formation. Further, it can also solve the problems with the final yield of osteogenic cells that can be derived out of bone marrow Considering growth factors and cells, perhaps an even more promising method is the implantation of genetically modified cells. This combines i transplantation and delivery of osteogenic factors at the same time and b already been shown to increase the effectiveness of both approaches3. The current investigation revealed that further research is required to achieve the final goal, i.e. 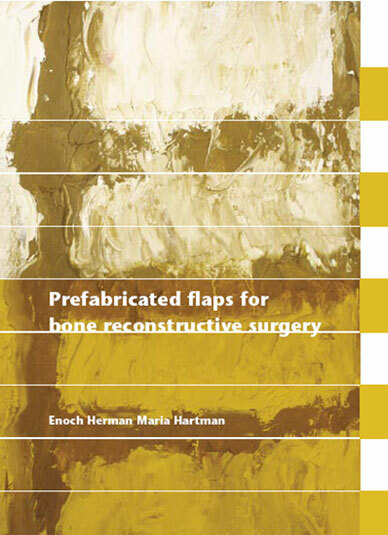 the manufacturing of preshaped tissue engineered bone flaps. This will undoubtedly imply major investments both financially and in terms of man power. However, we also experienced that the actual clinical applicability is still in its infancy4. Although the community could put questions to the enormous costs versus the small benefits of tissue engineering, this thesis showed that tissue engineering is in potency an important development in health care. In the future it will certainly be possible to reconstruct osseous defects in various parts of the human body with these techniques. Door de ontwikkeling van microvasculaire osteocutane lappen hebben reconstructief chirurgen een belangrijk wapen in handen gekregen bij het herstel van complexe hoofd-halsdefecten. Zowel de radialis onderarmslap, als de scapula-lap, crista iliaca-lap en fibula-lap worden frequent gebruikt voor het herstel van de mandibula. De reconstructieve voordelen van deze osteocutane lappen hebben in de literatuur meer aandacht gekregen dan de onvermijdelijke donorplaatsmorbiditeit. In hoofdstuk één wordt voor bovengenoemde lappen een overzicht van de beschikbare literatuur gegeven, waarbij aard, incidentie en consequenties van deze lapgerelateerde morbiditeit wordt behandeld. In de toekomst kunnen zogenaamde 'tissue engineered' geprefabriceerde lappen een belangrijke rol spelen bij het oplossen van dit morbiditeitprobleem. Het doel van de studie ten grondslag liggend aan dit proefschrift is dan ook om een methode te ontwikkelen voor de microchirurgische reconstructie van botdefecten, gebaseerd op tissue engineering technieken. Gebruik makend van deze technieken, kunnen gekweekte beenmergcellen gezaaid worden in een geschikt dragermateriaal. Vervolgens kan dit als implantaat in een geschikte plaats in het lichaam ingebracht worden. Nadat er voldoende botvorming is opgetreden in dit implantaat, kan deze zogeheten geprefabriceerde lap met behulp van microchirurgische technieken verplaatst worden naar een botdefect, zoals dat bijvoorbeeld is ontstaan na een segmentale mandibularesectie. In de opeenvolgende hoofdstukken van dit proefschrift, zullen de doelen, die in hoofdstuk één van dit proefschrift zijn gesteld, behandeld worden. Elk hoofdstuk is gebaseerd op een separaat onderzoek. 1. kan MRI gebruikt worden om op een non-invasieve wijze botvorming in een ratmodel in tijd te volgen en kan op deze wijze quantitatieve en morfologische informatie verkregen worden over het gevormde bot? Histologisch onderzoek is de gouden standaard voor evaluatie van botvorming in proefdierexperimenten. Dit maakt dat longitudinale studies alleen uitgevoerd kunnen worden door gebruik te maken van grote aantallen dieren. Daarom is gezocht naar een alternatieve methode om botvorming te bepalen. Hiertoe werden implantaten van gedemineraliseerde botmatrix (DBM) en geïnactiveerde gedemineraliseerde botmatrix (iDMB) subcutaan bij een rat ingebracht. Om de botvorming te volgen werden op één, drie, vijf en zeven weken na implantatie röntgenfoto's gemaakt en werden MR1 (magnetische resonantie imaging) opnames gemaakt. Na zeven weken werd de rat gedood en werden de implantaten uitgenomen voor histologisch onderzoek. Onze resultaten laten zien dat in-vivo MRI uitstekend botvorming met een minimale afmeting van 0,5 mm kan aantonen. Met behulp van deze techniek kan ook de driedimensionale vorm van het nieuw gevormde bot gereconstrueerd worden. Tevens kan de botvorming in de tijd vervolgd worden. De resultaten van de MRI komen ook goed overeen met de histologische resultaten die na zeven weken werden verkregen. In tegenstelling hiermee, bleken de röntgenologische afbeeldingen niet geschikt om het proces van botvorming in DBM te volgen. 2. wat is de beste niet-invasieve methode om botvorming te volgen, MRI of Dual-Energy X-ray Absorptiometry (DEXA)? Kan magnetische resonantie angiografie (MRA) gebruikt worden om de doorbloeding van de vaatsteel van een geprefabriceerde lap aan te tonen? Het doel van deze studie was om verder onderzoek te doen naar het gebruik van MRI, MRA en DEXA om de botvorming en de bloedvoorziening van een gesteeld bottransplantaatsubstituut te beoordelen. In 14 Wistar ratten werden heterologe gedemineraliseerde botimplantaten in een gesteelde adductordijspierlap gewikkeld. Eén rat stierf direct na de operatie. Van zes ratten werd botvorming en functie van de bloedvaten na zes weken geëvalueerd middels in-vivo MRI/MRA en post-mortem histologisch en histomorfometrisch onderzoek. Van de overige zeven ratten werd botvorming na 12 weken bepaald middels in-vivo DEXA en post-mortem histologisch en histomorfometrisch onderzoek. Na zes weken was er botvorming opgetreden bij vier van de zes dieren. De gemiddelde botvorming gemeten met MRI en histomorfometrie was respectievelijk 42% (±35%) en 25% (±19%). MRA-onderzoek toonde alleen bij deze vier dieren een intacte vaatsteel aan. Dit suggereert dat het verlies van de bloedvoorziening bij de andere twee dieren de oorzaak is van het niet optreden van botvorming. Histologisch onderzoek na 12 weken liet zien dat er meer botvorming was opgetreden, zonder tekenen van osteolyse. De histomorfometrisch bepaalde gemiddelde botvorming was 48% (+15%). Met behulp van DEXA kon deze botvorming niet aangetoond worden. De conclusie luidt dat in-vivo MRI een betrouwbare methode is om ectopische botvorming aan te tonen in een ratmodel. DEXA daarentegen kan niet gebruikt worden om de implantaten aan te tonen. Verder blijkt in-vivo MRA een zeer bruikbare techniek om de bloedvoorziening van spierlappen in dit diermodel te bestuderen. 3. wat is de invloed van de grootte van het oppervlak van het dragermateriaal voor de botvormende capaciteit? Als gedemineraliseerde botmatrix (DBM) intramusculair in ratten wordt geïmplanteerd, wordt ectopische botvorming geïnduceerd. In hoofdstuk twee en drie is beschreven dat de botinducerende capaciteit van verschillende DBM-implantaten sterk verschilt. Dit wordt mogelijk veroorzaakt door de eigenschappen van het DBM zelf. De vorm waarin het DBM gebruikt wordt, als één implantaat of in kleinere fragmenten, zou hierbij een rol kunnen spelen. Daarom werd in deze studie onderzocht of de vorm waarin DBM wordt geïmplanteerd inderdaad de botvormende capaciteit van DBM beïnvloedt. Zowel DBM implantaten uit één stuk, als DBM implantaten die uit kleinere fragmenten bestonden (MDBM), werden intramusculair in een ratmodel geïmplanteerd. Na zes weken werden de implantaten uitgenomen en werd de botvorming geëvalueerd middels histologisch en histomorfometrisch onderzoek. In enkele DBM- en enkele MDBM-implantaten werden significante hoeveelheden nieuw gevormd bot aangetoond, terwijl in andere implantaten geen of zeer weinig bot werd aangetroffen. Histomorfometrische analyse liet een gemiddelde botvorming van 2,6% zien voor de DBM-implantaten en een gemiddelde van 1,9% voor de MDBM-implantaten. Deze hoeveelheid botvorming was minder dan in voorgaande studies. Geconcludeerd wordt dat vergroting van het oppervlak door het fragmenteren van DBM-implantaten geen belangrijke factor is in de botinducerende capaciteit. 4. wat is de meest geschikte drager voor een construct, dat gebaseerd is op het gebruik van cellen? 5. wat is de optimale acceptor site voor een geprefabriceerde lap? Bottransplantaatsubstituten kunnen verkregen worden door de combinatie van drie bestanddelen: 1) botvormende cellen, 2) een geschikte drager, en 3) de aanwezigheid van biologische groeifactoren. Hoewel veel onderzoek is verricht om het ideale bottransplantaatsubstituut te ontwikkelen, zijn de resultaten nog niet erg consistent. De aanwezigheid van cellen en de doorbloeding van de receptorplaats worden als belangrijke factoren gezien voor de botinductieve eigenschappen van een bottransplantaatsubstituut. De hypothese is dat in een op cellen gebaseerd bottransplantaatsubstituut meer botvorming optreedt in spierweefsel, dan in subcutaan weefsel, omdat spierweefsel een betere doorbloeding heeft dan subcutaan weefsel. Om deze hypothese te bewijzen werden beenmergcellen (RBM) gezaaid op 48 titaniumvezelgaasimplantaten, waarna deze implantaten zowel subcutaan ais intramusculair in de adductordijbeenspier van ratten werden geplaatst. De hoeveelheid botvorming na één, drie en zes weken werd geëvalueerd middels histologisch en histomorfometrisch onderzoek, alsook door het calciumgehalte in de dragermaterialen te bepalen. De resultaten lieten zien dat de botvorming toenam gedurende de implantatietijd. Echter, zowel in de intramusculaire groep als in de subcutane groep bleef de botvorming beperkt tot 12 procent. Tussen de twee locaties kon geen significant verschil in botvorming aangetoond worden. Derhalve kon onze hypothese niet bevestigd worden. Het uiteindelijke doel van deze studies is om een methode te ontwikkelen voor microchirurgische reconstructie van botdefecten met behulp van tissue engineering technieken. In de onderhavige studie is gekeken naar de invloed van het microchirurgisch anastomoseren van de vaatsteel van een geprefabriceerde spierlap op de botvormende capaciteit van het uiteindelijke bottransplantaatsubstituut. Daartoe werden 16 poreuze CaP keramische implantaten, geladen met beenmergcellen, aangebracht in de adductordijbeenspierlap van ratten. De spierlappen werden omwikkeld met een siliconen membraan om vaatingroei uit de omgeving te voorkomen. Na vier weken werd de vaatsteel van acht lappen doorgenomen en direct hierna microchirurgisch hersteld. De andere acht lappen kregen een controle operatie, waarbij alle zijtakken van de vaatsteel werden geligeerd, maar waarbij de vaatsteel zelf niet werd doorgenomen. Vier weken na de tweede operatie werden alle implantaten uitgenomen en geanalyseerd met behulp van histologisch en histomorfometrisch onderzoek. In alle implantaten werd vitaal botweefsel waargenomen. Histomorfometrisch onderzoek liet geen statisch significante verschillen in hoeveelheid botvorming zien. Daarom luidt de conclusie dat in een ratmodel levensvatbare microchirurgische botlappen verkregen kunnen worden door gebruik te maken van een op cellen gebaseerde tissue engineering benadering. In dit proefschrift is de ontwikkeling beschreven van een methode voor de microchirurgische reconstructie van botdefecten met behulp van tissue engineering technieken. Er is een model gecreëerd van geprefabriceerd bot in een gesteelde en gerevasculariseerde spierlap in ratten. Het uiteindelijke doel om een mandibula te reconstrueren in de mens, moet nog worden bereikt. Hiertoe zal nog meer onderzoek moeten worden verricht. Een eerste stap zal het gebruik van een groter proefdier, zoals bijvoorbeeld de geit1-2 zijn. In grotere dieren zullen andere omstandigheden voorkomen, die nieuwe vraagstellingen zullen opleveren. Echter alvorens de methode toepassing te laten vinden in mensen, zal de effectiviteit van de combinatie van op cellen gebaseerde dragers en prefabricage altijd eerst bewezen moeten worden in hogere dieren,. In dit kader dient opgemerkt te worden dat de combinatie van groeifactoren en cellen met een drager voordelen kan hebben ten opzichte van het gebruik van uitsluitend groeifactoren of cellen. 3p deze wijze zou bijvoorbeeld de concentratie van groeifactoren, die gebruikt dient te worden om botvorming te induceren, verminderd kunnen worden. Verder zou wellicht ook het probleem van de hoeveelheid cellen die uit beenmerg geoogst moet worden om botvorming te bewerkstelligen, opgelost kunnen worden. Dit zal een tweede stap zijn in het komend onderzoek. Ten aanzien van groeifactoren en cellen, zou implantatie van genetisch gemodificeerde cellen nog veelbelovender kunnen zijn. Hiermee worden op hetzelfde moment cellen getransplanteerd en osteogene factoren aangeleverd. Er is al aangetoond dat deze methode de effectiviteit van beide benaderingen verhoogt3. Dit zal een derde stap zijn in het komend onderzoek. Het gedane onderzoek heeft geleerd dat er een grote investering in tijd en geld nodig is om het uiteindelijke doel, te weten het vervaardigen van door tissue engineering verkregen voorgevormde bottransplantaten, te bereiken. Wij hebben ook ervaren dat de huidige klinische toepasbaarheid van tissue engineering nog in zijn kinderschoenen staat4. Hoewel de gemeenschap vragen kan stellen bij de enorme kosten afgezet tegen de op het moment nog geringe voordelen van tissue engineering, laat dit proefschrift zien dat tissue engineering in potentie een belangrijke ontwikkeling in de gezondheidszorg is. In de toekomst zal het zeker mogelijk zijn om met deze technieken botdefecten op diverse plaatsen in het menselijk lichaam te reconstrueren.